They seem so easy to play. Bounce in the ball. Throw a dart. Pick up a bottle. But is something else at play? 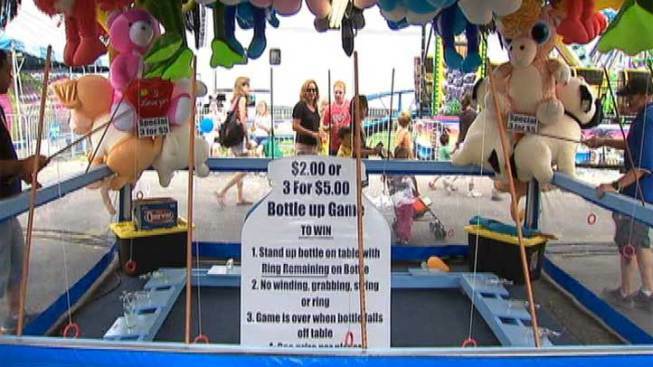 The News4 I-Team is going to show you the secret behind some of those carnival games -- starting with three milk bottles. Bruce Walstad is a retired cop who trains law enforcement on carnival games. He showed us the trick behind why it’s so hard to knock down all three bottles with a baseball. Making it almost impossible to knock over the remaining bottle. At the Montgomery County Agricultural Fair we watched another bottle game called Lift the Bottle. The carny who runs the game takes a fishing pole, slips a red ring over the neck of a glass soda bottle and carefully pulls it upright into a standing position. He does it over and over again. But when we and others try, bottle after bottle slips away. He says after a carny shows you how to do it, he can reposition the bottle so the heavy side is up, making it difficult to pull the bottle upright. Steve Ianni is the concessions manager of Powers Great American Midways, which operates the games at the Montgomery County Agricultural Fair. Ianni says you're practically guaranteed a prize playing balloon darts or any game where you compete against your friends. But he warns the bigger the prize, the harder the win. "There's a degree of difficulty in all the games. Some are easier to win then others. Some are winners every time, some aren't. We need a few losers to make a few dollars." Take Shoot the Star. You get 100 shots to completely cut out a red star. Ianni admits it takes a minimum of 80 perfectly placed shots to win. Made even harder when the sights are off, something carnies admitted to us at fairs in both Maryland and Virginia. I-Team: "How good is the aim?" Carny: "Um, it's not 100 percent." “These are toy guns,” says Ianni. “They’re not military grade weapons. They're accurate to a point, they're not dead on." He says this isn’t supposed to be real life. “This is entertainment. You know, cheap entertainment. You come here, three dollars you can play a game. You've got a chance to win a big teddy bear, you know what I mean?" But Walstad says many players assume they're going to get a fair shot, especially when they try to shoot a basketball. "The average guy going up to this game assumes this is what they are throwing at,” Walstad says as he points to a regulation NBA hoop. “But they're not.” Walstad points to what looks like a smaller basketball rim that’s been squeezed into an oval. “They're throwing at this. And your chance of winning? Slim to none." The I-Team watched player after player walk away empty-handed from the basketball hoops at fairs in our area. But Ianni says people do win or he wouldn't be in business. Standing in front of the basketball game he says, "They're not going to come back if they can't keep winning." And at that very moment, a kid behind him sinks the ball. Ianni grins and says, "I hope you got that on tape."